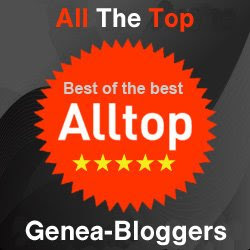 This is an article previously published on footnoteMaven.com in 2007, but with a few additions. I would love to post both sets of captions. I should have kept the buyer and seller information, but have been unable to find it (three computers ago). Even fM loses things. This also points out that in my beginning blogging days I assumed that links were forever. Foolish me! Do as I say, not as I do! 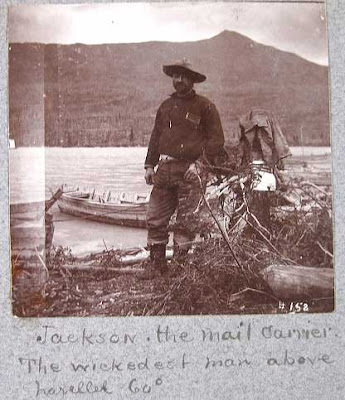 If you have an ancestor named Jackson, who was a mail carrier in Alaska in 1898, wouldn't you want to know he was "the wickedest man above parallel 60 degrees" and what the wickedest man looked like? Here is the Benedict's version of the caption held by the Alaska State Library - Historical Collections, PO Box 110571, Juneau AK 99811-0571, displayed by the Alaska Digital Archives, photograph found here. Now you can see why I'd love to publish Messer's comments to Neal D. Benedict's report The Valdes and Copper River Trail. I think I'd have to go with Messer for giving us the true flavor of this trip to Alaska. Very rare and historically important, 1898 Alaska Gold Rush Album of original Photographs compiled by a Boston Newspaper Correspondent named C. J. Messer who traveled to the Klondike Gold Mining Region with Neal D. Benedict in March of 1898. 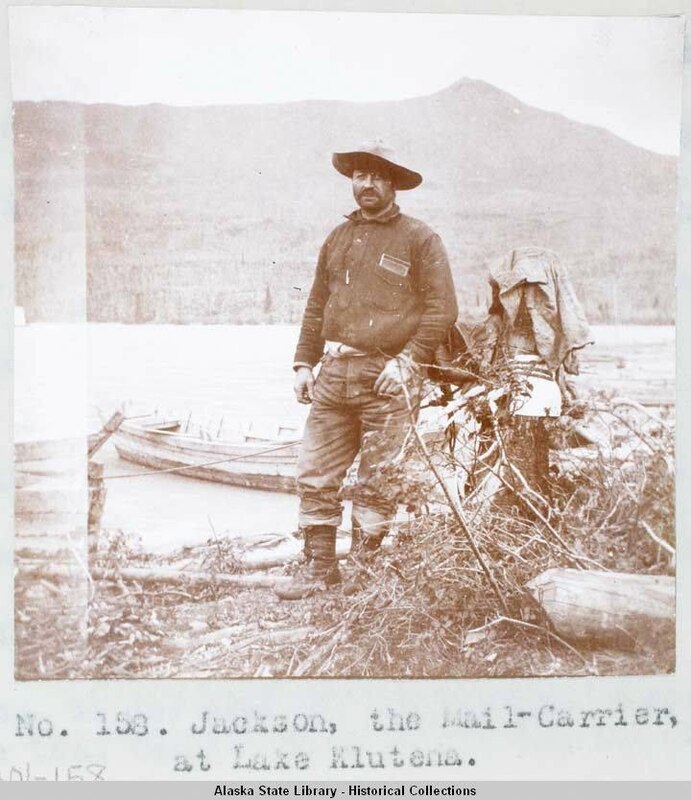 This Album is a recently discovered variation of the Neal Benedict “Report” which is among the most important collections of photographs documenting the early days of the Klondike Gold Rush. The Album / Scrapbook measures approx. 12" x 10" and contains 86 interior pages. Sixty of those pages contain original photographs taken along the route of this historic expedition. There are 176 original photographs each measuring 3 3/4” square and mounted 4 to a page. All 176 photos are of the same format and each has a detailed, hand written title beneath the image. Besides the 176 images taken on the journey to the Gold Fields, the album also includes approx. 22 photographs of "Folk Art" type drawings of the Gold Region and of Gold Miners in camp which appear to be the work of one of the members of Messer's group or perhaps the work of someone they met along the way. There are also a number of photographs, in various formats, mounted on the final pages of views in the Gold Regions, views of Portland, Oregon, and a few miscellaneous images (including a candid snapshot of Theodore Roosevelt). Glued to the some of the early pages of the Album are a series of newspaper clippings that tell a story of a trip to the Gold Fields. It seems that this is a serialized "story" written by Messer and published in an unknown Newspaper (he was a correspondent for the Boston Telegram, the Eastern Syndicate and the Associated Press). The tale of the trip (titled “Existence’s Price” ) is told in the style of a novel rather than a typical newspaper or magazine report. It reads almost like something written by an aspiring "Jack London". 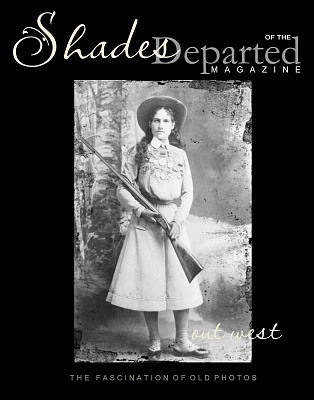 The author plays the part of a newspaperman who manages to attach himself to a group of associates headed for the Klondike Gold Fields and seems to follow the path that the Benedict / Messer group traveled during this expedition. Neal D. Benedict, a resident of Florida, was a member of the Connecticut and Alaska Mining and Trading Company, which prospected the Copper Basin in 1898. He drafted an account of the 1898 “Expedition”, which was illustrated with 158 original photographs. The manuscript (entitled The Valdes and Copper River Trail, Alaska) was never published but on April 7th, 1899 Benedict submitted 2 copies of the typescript manuscript to the United States Copyright Office. Both copies of the typescript were accompanied by 158 numbered and identified photographs taken during the journey. It appears that Benedict produced at least 1 other copy of his manuscript which also included the same 158 images. In 2007 one copy of the Typescript resides in the Library of Congress, one in the Alaska Historical Library (this is one of the 2 original copies deposited with the Copyright Office that was returned to Alaska at the request of Alaska’s US Senator) and the third which is owned by the preeminent Collector of Alaska Historical Material Candy Waugaman. The (previously unknown) Album offered here appears to have been assembled by C. J. Messer using not only the 158 images included with the Benedict Manuscripts but with 18 additional images from the same group as the Benedict photos, 22 images of Alaska Gold Rush “Folk Art” paintings and approx. 15 other photographic views (some of larger size) taken along their route. Of special interest is the fact that under each photo in this album there is a neatly hand written description of the image. In most cases this description includes the title given to the photograph by Neal Benedict (as seen in the previously known typescript copies) but Messer goes on to elaborate on what is pictured in the image. Sometimes he adds important information not found in the Benedict titles. In some cases Benedict’s titles are actually a less than honest representation of what appears in the image and the descriptions written by Messer in the album offered here take great pains to tell “the whole truth”. An example of this is a photo of Neal Benedict with his foot on a large log holding an ax. In the Benedict typescript this photo is titled “The Artist and Author of this work, Cutting Wood in Solemn and Solitary Grandeur near Camp Valdes”, while in the Messer Album the title reads “N. D. Benedict. Never cut down a tree in his life though from the general appearance you’d think differently”. 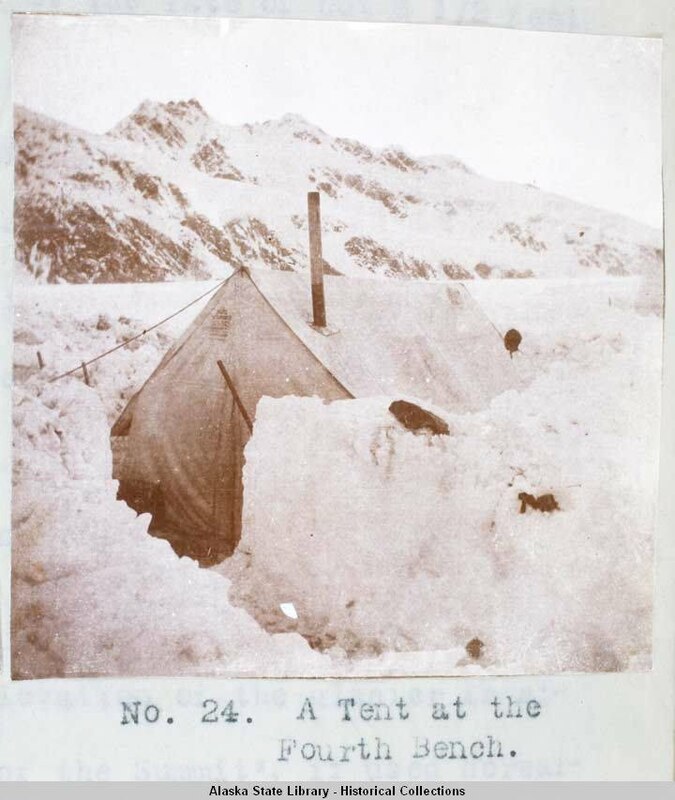 Another example involves Benedict’s photo Number 24 which is titled in his monograph “A Tent at the Fourth Bench.”. in the Messer Album that image is described as “The Camp of the woman miner who was later Mrs. Jinkings. This is the roof that the soldier sewed in “Existence’s Price”. Unknown. Wickedist Man. Digital Image. Privately held by the footnoteMaven, [ADDRESS FOR PRIVATE USE,] Preston, Washington. 2007. Unknown. Jackson. Digital Image. 1898. Held by Alaska State Library - Historical Collections, PO Box 110571, Juneau AK 99811-0571, displayed by Alaska Digital Archives. Unknown. Cutting Wood. Digital Image. 1898. Held by Alaska State Library - Historical Collections, PO Box 110571, Juneau AK 99811-0571, displayed by Alaska Digital Archives. Unknown. A Tent At The Fourth Bench. Digital Image. 1898. 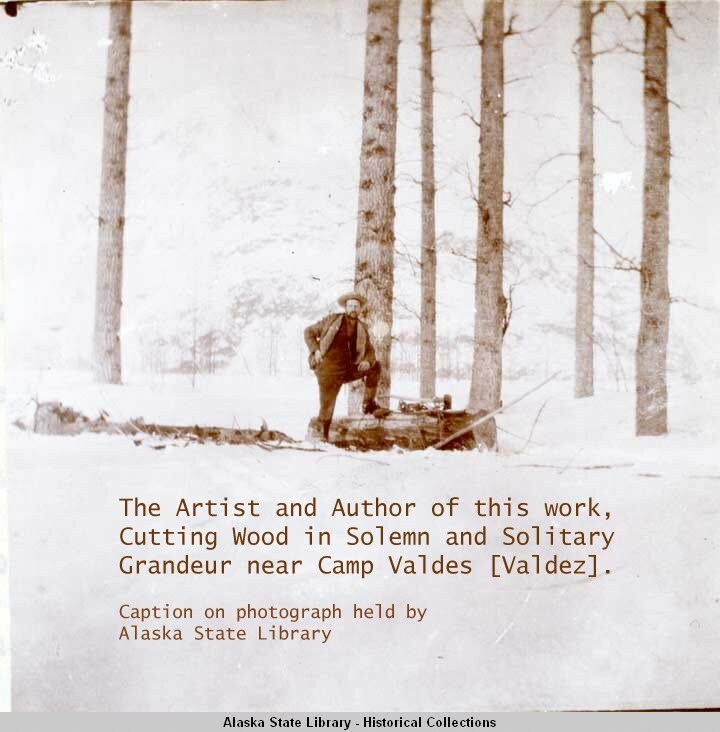 Held by Alaska State Library - Historical Collections, PO Box 110571, Juneau AK 99811-0571, displayed by Alaska Digital Archives.